The Department of Mathematics and Statistics is located on the top four floors of Burnside Hall, shown at the right. 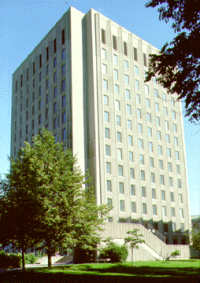 Burnside Hall is also home to the Department of Oceanic and Atmospheric Sciences, the Department of Geography, and the Computing Centre. Burnside Hall was constructed in the early 1970s, near the location of the original home of James McGill, the nineteenth century Scottish fur trader who left his estate for the establishment of an institution of higher learning. The name, Burnside, which was the name of James McGill's estate, comes from the Scottish word "burn" for brook or stream. Burnside Hall is located on Sherbrooke Street, the main thoroughfare of Montréal, right in the shopping and entertainment centre of Montréal. It is a five-minute walk from the McGill Metro, and ten minutes from Place des Arts, home of the Montréal Symphony Orchestra and L'Opéra de Montréal. Superb shopping and restaurants are within easy walking distance.